I love bringing the lowest into the highest realm of art hallways in the museums—to me that’s always been almost like church. It’s like you flip the world around; you play around with ideas and understandings of your reality, and mix it up. 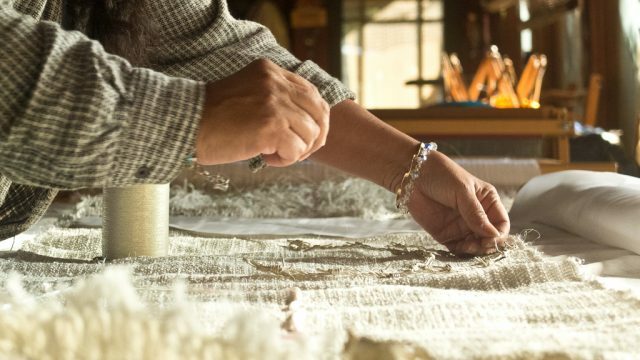 Consuelo Jimenez Underwood is most well known for her textiles and installation work. Her work represents her own history as a migrant agricultural worker, signifying her hybrid culture as well as the arbitrary lines that divide her homes. Artistic expression is deeply tied to traditional Huichol weaving, a heritage she incorporates into her large mixed media textiles. Borders and barriers are the vocabulary she uses to describe and celebrate the lives of migrant workers and indigenous people who are marginalized and downtrodden. • A weaving can be a form of expression. • Artists’ decisions about materials can contribute to the meaning of their work. • Artists work to integrate content into their form. • An artist’s choice of materials often depends on intended content. • In what ways do weavers create expressive works of art? • How can a “personal thread” create meaning in a weaving? • How do artists integrate content and form? 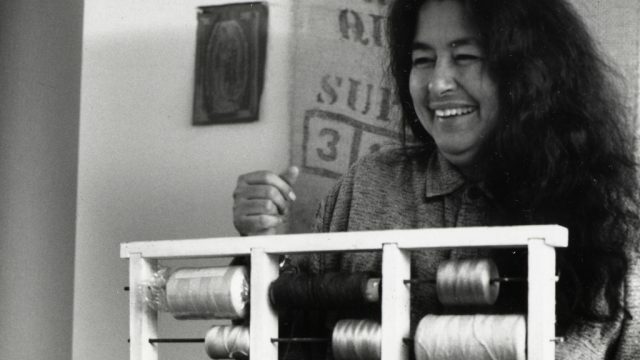 • Learn about the weaver Consuelo Jimenez Underwood. • Translate the expressive qualities of a person, place, or event into physical material. • Construct a weaving made of materials that suggest the qualities of a person, place,or event. • Better understand the interplay of content and form. Before playing the video ask the students a few questions about the craft of weaving. Have you ever made a weaving? 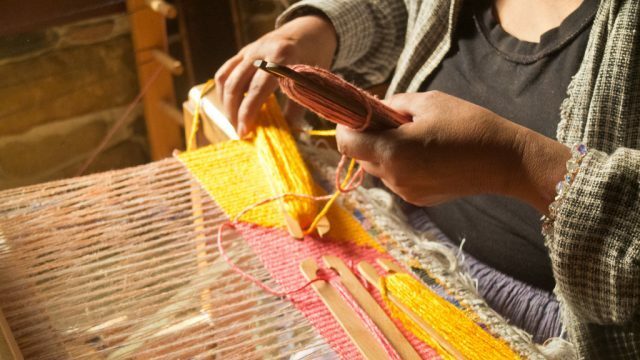 What function do you think weaving has served in society? Do you wear, or using something that has been woven? Examples of woven items such as scarves or hats can be passed around for students to inspect. Printed or digital visuals of a variety of weavings could also be available to help students understand the scope of this craft. View the video clip of Consuelo Jimenez Underwood found on the THREADS episode of Craft in America on the DVD or online at www.craftinamerica.org/shorts/consuelo-jimenez-underwood-segment. After viewing, engage the class in a discussion about what they saw. What kinds of materials did Underwood use in her work? What kinds of messages did she express in her work? What do you think about Underwood’s use of safety pins, wire, and other non-traditional materials? Help students understand that the artist uses these materials as threads in her work and that she chooses them purposefully—to represent ideas that are important to her. Introduce the idea of creating a thread that would symbolize something important to each student. Remind students that Consuelo Jimenez Underwood wanted to express ideas and feelings in her work. Underwood believed that wire was suitable for her, because she thought of wire as a “tough thread” and she thought of herself as a “tough” person. Underwood made a conscious decision to use materials that would directly contribute to the content in her weavings. Provide time for the students to think about and select a person, place, or event for which they would like to create a thread. They might choose themselves, another person, a favorite place, a tradition, an event, or even a social cause. Have students record their ideas in sketchbooks or on sketch paper. Instruct students to list expressive equalities that come to mind when thinking about their particular idea. (If a student is considering more than one possible idea then suggest they do this for each one.) The goal here is for the student to think about the physical, emotional and psychological qualities they believe are embodied in this person, place, or event—taking time to think deeply about their subject matter. Some of the materials may need to be brought in by the student; for example, an old t-shirt from a group activity would be one such item a student would supply. Have available a large variety of materials from which students can choose. Seeing these materials may inspire new associations and solutions for their chosen subject matter. Have students record any of these changes or new additions in their sketchbooks. Encourage the students to help each other determine the best way to create lengths of thread. An old t-shirt might be cut into thin strips and tied together; beads can be strung onto another material. 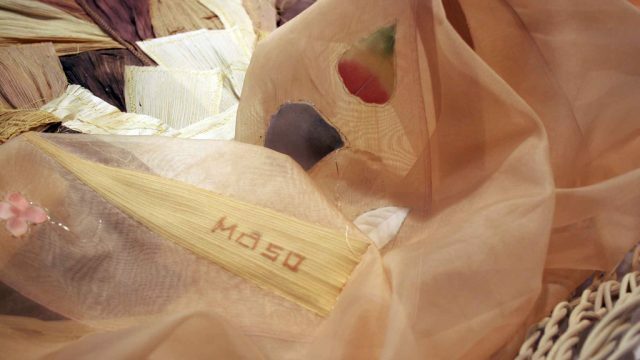 Some materials, such as cable ties, feathers, or sticks, may need to be set aside and introduced into the “thread” as the student is weaving. After the materials are tied, twisted, braided, or simply gathered together have the students wrap their unique thread around a 4”x 6” pieces of sturdy cardboard for safe storage until they are ready to use it in their weaving. The amount of thread needed will depend upon its thickness and the size of weaving students wish to create. Demonstrate to students how to set a warp on the loom. We advise the use of a sturdy, neutral material for the warp thread. 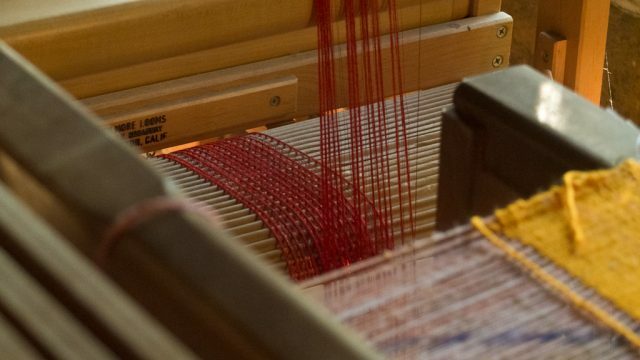 Once the warp is set, demonstrate the basic over-under technique and any variations you believe your students are ready to try. Describe what happens if the thread is pulled too tightly as they wrap the thread around the edges. You can give the students the option of frayed edges, which will avoid the hour glass effect entirely. When complete, demonstrate how to carefully remove the weaving from the loom and tie off the warp threads. Depending on the teacher’s curricular goals for any given class, and since the focus of this lesson is to get students thinking about how content informs materials and how materials can create content, we do not wish to limit studio solutions to one particular format. Here are some possible end-products. • This project can function as research for a future work, informing the materials to be used in a larger weaving or multimedia work of art. • Let the weavings remain as straight forward visual expressions of subject matter about which the student cares deeply. Have students title their work and create a display that includes a brief statement that lists each material and what expressive quality each material represents. • Finished weavings can be made into small pouches, book marks, or stitched onto backpacks allowing students to integrate these materials and expressions into their daily lives. • Students can be challenged to weave a pictorial image to further their statement. Rather than weaving with multiple materials as one “thread” students can use each material singularly to create the different parts of the image. Looking at the final products, have students conduct a Peer Review in which they attempt to understand the content of another student’s weaving. Remind them to talk about possible meanings of the materials used and the qualities they represent. Encourage students to discuss the subjective nature of the materials and how our own contexts and experiences can cause us to interpret things differently. 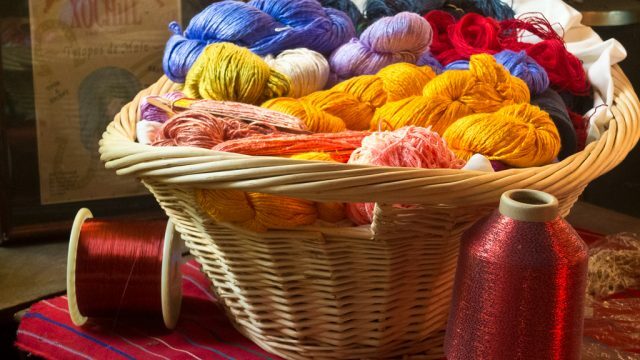 Have students consider the following question in their sketchbook/journal: What was harder or easier—the physical act of weaving or deciding what materials should be used in your personal thread? Why? • Describe the work of Consuelo Jimenez Underwood. • Understand why weavers might choose to use non-traditional thread. • Explain how they determined which materials best suited their own personal thread. • Create a simple over-under weave using materials that contribute to the meaning of a weaving. The Education Guide for THREADS was developed by art educators Amy Albert Bloom and Dolores E. Eaton under the direction of Dr. Marilyn Stewart, Professor of Art Education, Kutztown University of Pennsylvania, Kutztown, PA. Lead Author for Consuelo Jimenez Underwood: Weaving Together Content and Form is Dolores E. Eaton. April 2012.